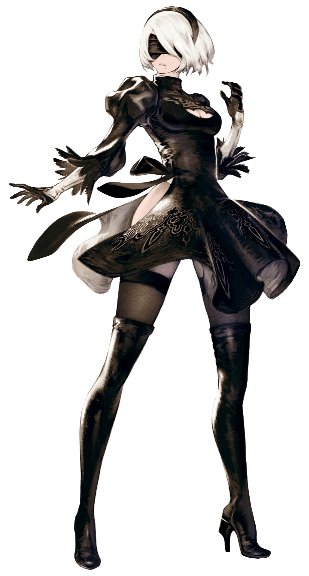 YoRHa No.2 Type B (2B) is a Playable Character in NieR: Automata. She is the female protagonist of Route A. Member of YoRHa - the automated infantry squad. The B-type model specializes in close-quarters combat. Begins the game wielding the Virtuous Contract short sword and the Virtuous Treaty large sword. Has cool, calm, and collected personality. Reputable among fellow androids for being "too serious". Initiating self-destruct (hold L3+R3) will get rid of her skirt, additionally it will cause a huge explosion. In this more revealing state, running through water will also make her...assets...wet and shiny. Height: 168 cm (with heels), Weight: 148.8 kg. Her three sizes are B:84cm W:56cm H:88 cm. (Taken from the Official Nier Automata World Guide). The player can attempt to peek up her skirt only the result her pushing away the camera. Keep on doing this for ten times will unlock a trophy. If you rub the controller touchpad she will do a pat on the head of Pod 042. You can "remove" her visor by wearing the Camouflage Goggles, unlocked after Ending C.
2B's official designation is Class E, Number 2 (2E). Class E androids were a special class used for the execution of YoRHa members; they would take on the appearance of certain people to maintain constant contact with their target (2E would take on the form of a B model android, a combat model, in order to not arouse the suspicion of 9S). Because S class models were high-end models, Command knew that 9S would eventually discover the truth about Project YoRHa and the Council of Humanity. Thus, the Commander issued an order for 2B to kill 9S everytime he would discover the truth. 2B eventually accumulates emotional grief from killing 9S numerous times in the past, which could insinuate why she maintains a completely platonic and distant relationship with 9S. In the TGS 2016 trailer, the characters of Nier Automata were showcased along with a word/emotion that represents them the most. 2B's was 信念 (Faith). You can unlock the Revealing Outfit for 2B by clearing arena battles in the Flooded City colosseum from DLC 3C3C1D119440927. This outfit is the exact same one worn by Kaine from the first NieR game. What a shame they cast Rina Chan as the English VA. Whenever I was about to be sucked into the moment, her voice was always there to remind me it&apos;s just someone reading a script. FFS It&apos;s a lead role, don&apos;t cast someone with such a generic and forgettable voice who specializes in voicing flash animations. I can only imagine how much worse the other auditions must have been.